Following a tradition established many years ago, Bermuda-grown Easter Lilies will be sent to the Queen, with the flowers having left Bermuda on Tuesday evening’s British Airways flight. A spokesperson said, “The Governor, Mr John Rankin CMG, participated in the annual picking of Easter Lilies for Her Majesty The Queen. 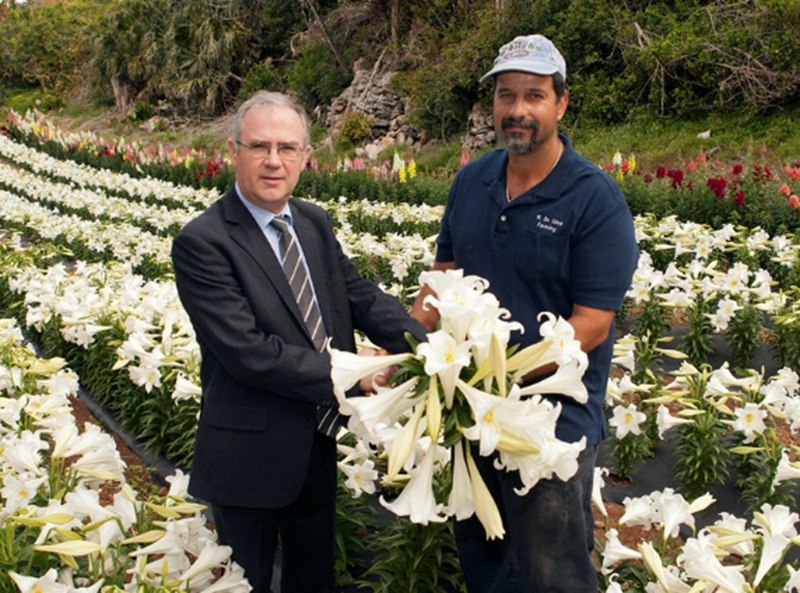 This year’s Easter Lilies were grown by Manuel DeSilva Jr [pictured with the Governor] on property which his family has farmed for the last 40 plus years. No Press release condemning this from the PLP?? How shocking. Wow what a difference a year makes last year the Governor and Wife Proudly sent their own that was grown on their Own property by the capable grounds Staff at Government House at the time. How could management flop with this easy job. Time to seriously look at the management there in place now. Hey girl, hope you like de lilies! On top of de $2 Million we send every year. What a beautiful maintained garden. GH should send this photo to the Queen.